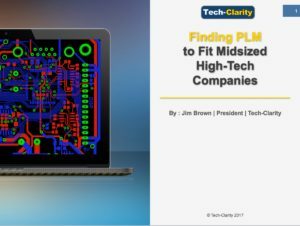 The Finding PLM to Fit Mid-Sized High-Tech Companies ebook explains how smaller companies in the high technology industry find themselves stuck between full-featured Product Lifecycle Management (PLM) systems that feel out of reach and less capable solutions including cloud-based file sharing or very basic data management applications. They know they can’t afford the errors and inefficiency inherent to informal data and process management, but can’t afford a large time, resource, and financial investment to fix their problems. Unfortunately simple solutions like web file sharing, while very attractive, fall short of their real needs, don’t help them improve their business the way they need to, and don’t leave them room to grow in the future. They need to find the “sweet spot” of a solution that helps them get started quickly with the basics of controlling, managing, and sharing product data but provides the features they need to be successful now and into the future. Please enjoy the summary below, or click the report or title to download the full PDF from our sponsor, Dassault Systèmes (free of charge, registration required). Watch the related webinar on demand on the Dassault Systèmes site (free of charge, registration required). Leading high-tech companies are driving breakthrough innovation and growing rapidly. But developing today’s high-tech products is increasingly complex. It requires systems-level thinking, collaboration across disciplines – and lightning speed. Midsize companies have to overcome this complexity and work closely with their supply chains to meet rapidly changing market demands and compete with their larger competitors. Product Lifecycle Management (PLM) software can help. It drives better product development performance by managing product-related data, processes, and projects. While smaller companies may try to control, access, and share product data with relatively simple Product Data Management (PDM) tools, larger companies rely on full-featured PLM systems that help automate processes and share data across global supply chains. Midsize manufacturers need to choose a system that quickly delivers the core capabilities they need to streamline product development but also gives them room to grow value over time. 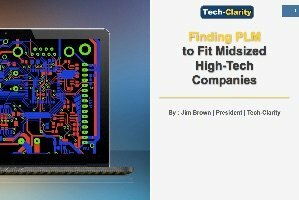 So what’s the right size PLM to fit a midsized high-tech company? Let’s take a look. Core PLM can quickly add value to midsized high-tech companies by helping them combat complexity, improve productivity, and innovate faster to meet market needs. Recognize the potential value of a fully featured PLM with all of the bells and whistles, but be honest with yourself about how much time and effort your company can afford to get there (at least right away). Don’t take on too much. Start with the basics and get value quickly, but recognize the shortcomings of simple file sharing solutions that fall short for the complex, multi-discipline products and product development environments common to midsize high-tech companies. Look for a solution that allows you to design in the context of your products in real time, but also in the context of processes and product development projects. In addition, look for PLM that incorporates automation including automatic project updates to keep engineers focused on innovation instead of managing files. Finally, make sure to leave your company room to grow as your business and business needs grow, using the initial implementation as a foundation for greater improvements. *This summary is an abbreviated version of the eBook and does not contain the full content. A link to download the full eBook is available above. If you have difficulty obtaining a copy of the research, please contact us using the “Contact” link below.